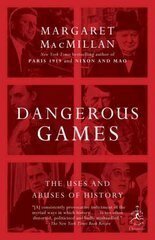 Dangerous Games 0 Edition Acclaimed historian Margaret MacMillan explores here the many ways in which history affects us all. She shows how a deeper engagement with history, both as individuals and in the sphere of public debate, can help us understand ourselves and the world better. But she also warns that history can be misused and lead to misunderstanding. History is used to justify religious movements and political campaigns alike. Dictators may suppress history because it undermines their ideas, agendas, or claims to absolute authority. Nationalists may tell false, one-sided, or misleading stories about the past. Political leaders might mobilize their people by telling lies. It is imperative that we have an understanding of the past and avoid these and other common traps in thinking to which many fall prey. This brilliantly reasoned work, alive with incident and figures both great and infamous, will compel us to examine history anew—and skillfully illuminates why it is important to treat the past with care.